Babblings of a Mommy: Creating Home Galleries. They add such warmth and personality to a home, don't they? They're also a very inexpensive solution to filling up a large and lonely wall. 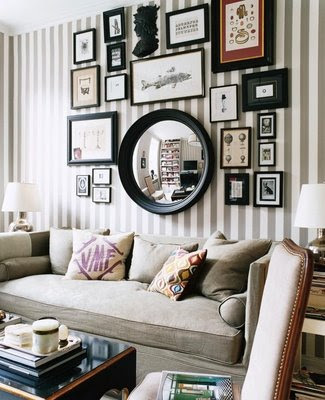 You can add almost anything to a gallery--even mix and match frames and still have a beautiful display on the wall. I personally like to use photographs. In fact when you first walk-in to my home I have a large wall that I placed a series of black and white photos flanked by a silver antique mirror. My daughter's room also has a small gallery of all her favorite Disney characters alongside an adorable vintage purse. My home office (aka my mom cave) displays the streets of Paris. 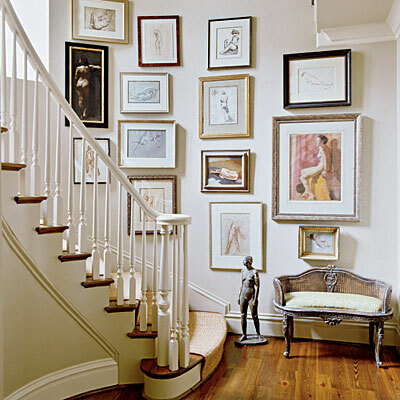 I think creating galleries around the house are a fun way to give your home a little character, don't you think? Yes I definitely agree and I do the same in my house. It gives at home feeling. Thanks for sharing and enjoy your holiday weekend!! Thank you Tye! I hope you enjoyed your weekend as well. That is absolutely gorgeous. I have always wanted to do that. Cute Blog! I loved it so much I decided to follow! Happy Monday! I would love for you to stop by and check out my blog as well! If you like it you can follow back! Thanks! Hope to blog with you again soon!